It’s funny. Well, maybe not funny. But there’s often a lot of talk about how to make the most out of your small rooms. However, I think that in a lot of ways, decorating a very large, cavernous room is far more difficult. Still, if space is tight–and it often is in large cities where small cramped spaces can be a problem. And some free-standing homes may be lacking in space, as well. Unless a room is insanely small, it’s not necessarily a bad thing. Small rooms are cozier and more intimate. But still, we need places to put all our stuff. I know. I know. It’s a bloody drag. And I know about the konmari book. The only thing I have to say is, it’s better to start doing it before it comes time to downsize. Otherwise, the task can be quite difficult. Very pretty apartment with a fireplace. Open, but not too open. here is where you can see more ceiling mouldings. 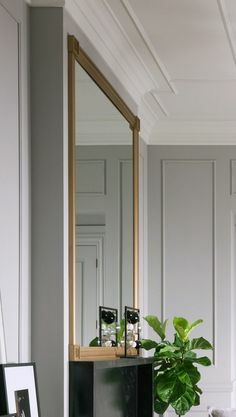 Mirrors are wonderful to expand space AND light. In fact, if you put a mirror directly across from a window, it’s like having two windows. What an elegant home! You may notice that it looks like the entire right wall is mirrored. Hiding the stuff is always a good idea. Yep, we know that one. If you are lucky enough to have a high ceiling, even if the foot-print of the room is not so big, it will give a sense of space. Yes, it’s a gorgeous room. Great bones! But perfectly done. The upholstered furniture is just the right scale. The tall lamps look perfect because the ceiling is so high.The large scale art adds the right amount of drama. And the light, but large plant adds a note of chic. Yeah, we already know that one. But also finding creative ways to find space such as an office that can disappear when necessary. I love offices that can vanish within minutes. 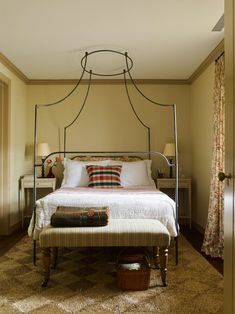 Here, a beautiful vignette emphasizes the room’s height. But going high can also mean creating storage situations, especially in closets that make use of every bit of space. I just have to interrupt myself. Anyone notice anything? Yes, it’s our yummy William McLure lamp. In the first image, it looks like it’s covered with primer before they were sprayed with red lacquer. haha. Very possible! So much can be done with paint. I’ve long admired this bedroom with its chocolate-brown walls. But what is especially wonderful is that she took the color up on the ceiling too. Believe it or not, this is the bedroom of her teen-aged (or he was then) son. Very sophisticated. The darker paint will lift the ceiling. 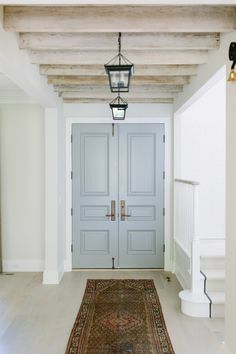 Even a pale grayed down blue-green will make the ceiling appear to float higher. Here is a good post for ceiling colors. The entire home is gorgeous! It’s the same one as the dining room at top with the mirrors. Do you really think that he’s painting on his rug? haha. And with the dog right there? So cute they are! And talented. But William changes his entire decor as frequently as some women change their hair styles. And he paints EVERYTHING. He painted the stripes on the floor. That’s a great room expanding trick. He painted the stripes on the kitchen floor too! It was a black and white linoleum floor (see below) before he got his paint brush and tape out. I understand that he moved a few months ago, so we’ll be seeing a lot more from him, I’m sure. It may seem counter-intuitive but a large piece of art can make a room feel far more expansive than a couple of dinky pieces. But if doing an art-wall, like the ones below, you can still cover the wall. I really hate it when the art feels to small for the wall or the composition feels too small. Heather’s style is incredibly charming and she makes the most of her small New York apartment. If you don’t already read her wonderful blog you can check it out here. I’m sure that for some people this is “busy,” but I think it reads as personal and homey in a sophisticated way. It reminds of a cross between Timorous Beasties and the book matched stone. I’ll be doing small kitchens soon, but I wanted to get this one in because I think it’s so cool! This mural is only $298.00! It’s nine feet high x twelve feet wide. An important thing about wallpaper is that the pattern need not be ditsy because the room is small. Larger scale patterns look great in small spaces. Oops. I see lots of black and blue toes. That’s better. Sometimes just turning things around can make a huge difference. Just watch that the art isn’t butting up against the moulding. I would’ve put the bottom piece of art over the chair. I bet they saw that later too. Sometimes things show up in photos that don’t show up in real life, so much. Uh oh… Great idea, but what happens when someone tries to come through the front door? This entry is lovely, and I love the Pembroke table. Alas, it’s a little too big for the space. Furniture should not overlap door and window casings. Poor pooch looks like he’s wondering what the milk-bone is going on with these strange folks in the house. This entry is Goldi-Locks-ready-just-right. Everything in scale and even a little place to hang up a coat and put keys. This is very tiny apartment! Fabulous library in Farrow and Ball Hague Blue. The rest of the house is awesome too! Lots of examples already on this page. It keeps things lighter and more airy to have the legs on upholstered pieces. One exception would be if you need a sleep-sofa. And bench cushions (seat cushions in one piece) are a great alternative to having two cushions on a smaller sofa. Love these pivoting sconces from Visual Comfort. It’s a great solution when the night tables are very small. And here, we can see that they are the kind that doesn’t require a box in the wall. I love the idea of having a little work space between two beds. It would work out well, I think for a kid’s bedroom too. Have to say that I think this is immensely charming. It would make a great kid’s bedroom. But another idea that came to me is what if there was a pocket door that could close off the bed and voila, it goes back to being the home office or library when guests aren’t staying over. There could even be a trundle-bed built in. But I do love the storage underneath. And I found this book on One King’s Lane. It’s only nine bucks, so might be worth picking up if you need more ideas. Do you have any great tips for small rooms? Please share! I’m sure that there are many more. LOL. I know what you mean. I did help with a home last year that’s a new home. In fact, I just posted an image to instagram. I think that they did a terrific job and it does not have that cookie-cutter new house look. You can see images here. I know how much I love an article by how many re-pins I do. was the star & I loved the way it’s all thrown together so apparently, nonchalantly . My week just wouldn’t start out right without your blog and my morning cup of coffee! Today’s topic is so timely as we hope to begin building our retirement home shortly. It’s not tiny, at 1500 sq ft, but still much smaller than our previous homes. Your perspective of cozy and human-scaled has greatly encouraged me as I plan. Thankfully, we’ve accomplished your first tip….pare down. Painful! but all our worldly goods are now in 2 (large) storage units, awaiting completion of our home. Can’t wait for what you have to say about small kitchens. Thank you for this amazing gift…your blog, and also for your two color collections. So much fun visualizing different ways to go with the colors. Oh dear. I’m from the midwest, so please understand that it’s not your fault. Wallpaper NEVER went away! It went away from HGTV perhaps, but HGTV is design for the masses. I did a post or two about wallpaper a while back, but perhaps it’s time to discuss it again. Of course, there’s wallpaper and then there’s wallpaper. The kind I’m talking about is not sold (for the most part) at your local paint store. Here are four of my favorite sources, amongst many others. What a wonderful post-so much eye candy to swoon over on this cold, rainy Sunday. And I adore that Anthropologie mural that you are considering for your hallway. I just want to express my gratitude, Laurel (one of many I hold for you)) for encouragement I got from your posts and answers here to go ahead and paint my ceilings. No doubt it lifted them up. I was scared as hell to do that, I was worried what the painters would say(they were nice. did seem a bit puzzled lol), yet I went with it-and it was one of the best decision to make in a smaller home with lower(almost everywhere) ceilings. Of course we wanted to add crown moldings as well-but one needs to choose his battles with himself when gut remodeling. Loved the mirrors in one of your first photos today–and your comment that the right wall in one of the rooms appears to be all mirror. And lovely and bright it is! Years ago we added a wall of mirror to our darkish dining room. The mirror doesn’t reflect the expected amount of light from the opposite windows. And every color I’ve put on the other walls in that room NEVER MATCHES THE CHIP. Oh dear. A lot of people don’t realize this, but glass IS already tinted a light green. You can see it if you see a thick piece of sheet glass. The side edge will be very green. Mirrors because of the silver backing aren’t green. I’m wondering if you could do something with the lighting to counter act the green. The dark brown walls and ceiling in the bedroom. It made me happy to see that application. It is what I did for my lower level (better known as a basement). this is the thing that bothers me about so much of the interiors in magazines: functionality. Maybe it’s because I was an engineer, but when I see that gorgeous blue library with a giant couch crammed up against the bookcases – I’m like?? You crawl up the back of the expensive sofa to reach the books?? and dining tables full of stacks of books too…the house looks like a store full of merchandise. I love multi-purpose rooms but I wish there was less blending between actual interiors of homes, storefronts, and stage/set building for movies. Do you have an idea what paint color is used in Heather Clawson’s room? Greyish/greenish/blue? I think that the mural would be a wonderful continuation of your living room pillow fabric, and your folding screen. Beautiful and sophisticated. Thank you so much Laurel for another fantastic article! I am currently working on a guest bedroom (12’9″ x 13’6″) and am leaning towards using dual purpose furniture. To summarize; as I wish a Queen size bed that I made a floor to ceiling upholstered headboard for (Lord, knows what I was thinking at the time … ☺); I am equipping the rest of the room with two small bench seats that will flank its end, one of which will also serve as a seat for a shallow’ five drawer desk (a 2nd hand store find that I plan to refinish) that will also be used as a vanity and a dresser. Also in lieu of a luggage rack, I am just toying with the idea to have a drop-leaf surface attach to its end to accommodate a suitcase. As for night tables; I am opting for custom built and wall hung. a) – yes, that was me! Thank you Laurel for the confirmation (and the compliment). I so look forward to your Sunday posts! This one interested me even more than usual since we have a small apt. But what I loved most was reading your rules about how art frames shouldn’t bang up against molding, how furniture shouldn’t overlap door frames, etc. As we house-hunt and measure, and try to imagine built-in bookcases and our case furniture on wall after wall, I’m constantly telling my patient husband that this or that won’t fit because of doorways, moldings, etc., and he thinks I’m making it all up! I was actually beginning to wonder. Now I feel vindicated! Say YES to the mural!!!!….. you could also add handpainted details to make it your own “one off”. It’s certainly a bargain and would add such drama to that space. I think I will, but I have to decide whether to do the entire thing or just part. I am thinking the entire thing because it’s chopped up a lot except for three sections. But then, I would need 4 murals. Maybe I could talk them into something (more than by paltry 10% off) if I do a post about it with GOOD photos, not the crap they post on their website that folks have done. Go for it!!!! Think of the drama it will add to the space. The other option, albeit costly, would be mirroring the opposite walls….hmmmmmm. No, that won’t work because it’s too windy. Hold on. Here’s the floor plan– in this post which is one of my favorites. And no, this apartment did not sell and it’s not going to. Oh gosh. If I could roll back the clock 4.5 years ago, I would’ve closed and then done a little reno. The floors and some of the baseboard mouldings are in terrible shape. That’s so interesting. I am such a klutz. I can assure you that the rug as well as the dog and I would be covered with paint. There would be paint in the next room too! I always wonder with abstract works such as this how they decide what the shapes will be, the colors, etc. What a lovely way to start my Monday! Although it’s funny. My two busiest days of the week (normally, if one can call this ‘normal’ haha) are Saturday and Sunday. Thank you so much! The blog and all that goes with it feels so much like a culmination of all the parts of my past that made me what I am today. I’ve thought about the kitchen too. The kitchen needs some work and another issue is that it is actually in the shape of a trapezoid, so the near end is only about 4 feet wide and in the back it is close to 8 feet including the cabinets. Also, there was a leak and I’m not sure if it’s fixed or not. I know… The cow above me. Yes, cow. She finally got evicted after trying to burn down the building at least twice and calling her health home aide the n word! yikes!!! But I also had floods from above in the bath and kitchen a few times. It looks like there may still be a persistent bathroom leak. Ahhh old buildings. Great article. As I was reading, I got to thinking…wouldn’t it be fun to see a “I would have done it this way” article. Such as the table by the door is a bit too big, or the picture hung too close to the moulding. These are things I would not think about unless you point them out. Just a thought. I have to be careful about being critical of other people’s work. First of all, in the case of the art, the owner isn’t a professional designer and it may not be the way she had it in real life. They do all sorts of stuff for photos. But there should always be some breathing room. One time, I did put a photo up and it was an acquaintance of mine. Oh man… she was very angry with me and I was mortified. I guess that makes sense! Thanks for getting back to me. Dear Laurel, Yours is the highlight-email of my week! Have you ever investigated sofa beds and discovered ones that are firm and comfortable? Much as I look and sit, I haven’t found one that I would trust. Thank you so much! As for sofa beds, I’m not sure if you mean the bed part or the cushion part. I have one from Lee and the seat cushion is very comfortable. I think I did the Natural Lee. It’s a bench cushion. Normally, I do spring down but didn’t want to spring for the upgrade and thought I would try it out. Yeah… I looked them up. Yes, it’s sort of contemporary. Not my thing aesthetically. But that’s just me. It would be good for a room that is used primarily as a bedroom and only sometimes needs to be a sofa. Most of us over here, want a piece of furniture that is not obviously a sleep sofa. well the one we got did look like a sofa:) quite a normal sofa. We had it in our tiny “living room” for several years. I admit I went for a horrid print after seeing a teeny sample-a rookie mistake(I was 22 and very pregnant). When it arrived I promptly ran to a store and got a huge plushy coverlet, and it leaves the sofa only when one prepares to go to sleep. Don’t know what they have on display right now..things obviously change. But yes, it’s a challenge, to have it both ways. I think it was easier in Europe since more of an apartment culture..hence more solutions. Or maybe it was easier many years ago. My parents slept on a very yummy looking sofa that unfolded for the night, and it was very comfy. They had not much choice too-theirs was a living room, after me moved to our own apartment from the communal flat. For our guest bedroom, I got( on Craigslist actually) a very bulky daybed from Ballard Designs that I wouldn’t choose at all..but it has a roll out bed, two normal mattresses, and gives you versatility to accommodate different guests in one small room. Sacrificed myself for the sake of guests lol. But you know I got a beautiful quilt and added throw pillows I love..put there the best curtains I own..I was so upset about the room and the bed at first but it turned out to be one of my favorite spots in the house. I used a lot of patterns-but the colors are almost all on the warm side, and the embroidered curtains’ background does match the wall color to the “t”. I often want to take a nap there myself. The more thought and effort we dedicate to something the more we love it I guess. Yes, there are lots of gallery walls. I’ve done a few posts about them and should’ve linked to them. I can do that here, if you’re interested. I love finding your latest post in my in-box on Sunday morning. It goes so well with my coffee. What a wonderful post!I love that mural, and the price is unreal! I think in the right hands, and in a well proportioned room it could be wonderful..
It’s funny, I have a preview on my phone that sends me my instagram and FB messages. It pops up if all I do is pick up the phone (even when locked). Well, yesterday, I posted a cropped image of this on instagram and somebody wrote that there were lots of options less expensive. I love William’s black walled nook, I wonder if it was created in a larger room by using a curtain on the right side? Question about the Goldilocks room. The paintings (?) above couch are they paintings or mirrors that were painted over and paint removed in spots to reflect the opposite wall? Either way I love the look. The black wall was in William’s bedroom. I believe that the entire room was black, but I have also seen it painted off-white. The curtain is from his bed. Alas, he’s left that home. Good question about the art. I think the art on the opposite wall is just reflected in the glass. There is something called museum glass that won’t do that. 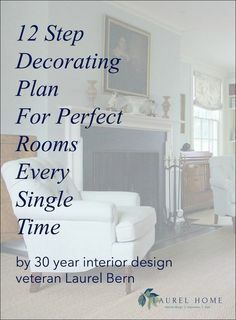 Laurel, I am very interested in this subject as we are getting ready to put our home on the market and have been wondering how to make one tiny bedroom look as spacious as possible! As far as other ideas to make a room larger, I’ve always heard that putting tile (or other flooring) on the diagonal can make a narrow room feel wider. Years ago, we added a chair rail in our rather long, but narrow, hallway and put wallpaper on the wall below it. We noticed that it instantly seemed to make the hallway seem wider. We thought that perhaps that was because, by visually dividing the height of the walls, we had created the false perception that the width to height ratio of the hallway was larger. Do you think that adding a chair rail with different colored wall below makes rooms feel larger in general? Have you ever experienced this? Just wondering what your thoughts are on this. Actually, for a small space, it’s better not to chop it up too much visually, but again it really depends on the situation. Thank you Phyllis! One little trick I have is there is a built-in editor that tells me when I’m using a cliche. That’s often when I make up something else.